I hope you are having a warm and sunny summer. Today here in Edinburgh it’s cool, breezy and rainy, but not awful enough to start flicking through Caribbean travel brochures, credit card at the ready. We are still holding out hope for at least a smidgeon of sunshine to remind us it is mid-June, and nearly the longest day of the year. By the look of outside residents here might think they had done a Rip Van Winkle, waking up to a rather autumnal-feeling day and wondering ‘did I miss summer?’ Still, at least the pollen count is low! Regardless of the weather many of us drink quite a lot of soft drinks at this time of year. Hot tea and even coffee tend to get replaced by refreshing and replenishing drinks as we get more active outdoors. Those of you in warmer climes will have a head start on us here in northern Britain but most of us will be having a few chilled drinks throughout the day. What do you like to drink at this time of year – squash? Cola? Iced tea? Sports drinks? Green tea with pomegranate and agave? Most of us will be drinking at least some soft drinks, even if they aren’t what we technically think of as soft drinks, i.e. cola. The definition of what is a soft drink varies by country (and scientific study) but mostly includes non-alcoholic carbonated, sweetened and flavour-added drinks. They may or may not contain caffeine or fruit juices. Milk, chocolate and coffee drinks are almost always excluded. History Bit: Soft drinks, despite their modern appeal, have been around for quite awhile. Shortly after Joseph Priestly invented artificial carbonation in 1767, various chemists in Europe began adding spices and juices to ‘phosphate soda’ (mmm, sounds tasty – not). By the mid 1800s American pharmacists really ran away with the idea and were adding medicinal herbs to sparkling and non-sparkling waters, some of which are still used in some fashion or other today – for instance sarsparilla, dandelion and sassafras (in rootbeer). These herbs were often used as a way of disguising the taste resulting from dodgy water supplies, but were marketed as ‘for your health’. The idea of the sofa fountain and the mass marketing of soft drinks was well underway by the mid 19th century. Vending machines in the 1920s, and shop-purchased canned soft drinks in mid-20th century further fuelled our love of fizzy drinks. Figures from 2004 show that global soft drink consumption was estimated at 400,000 million litres (including bottled water), of which colas and the like made up 40%. Science Bit: There are downsides to this inexorable rise in our global love of carbonated and sweetened drinks. There is a slightly biased but interesting article at emedexpert that explains the pitfalls in detail, but I have done my own version here. 1) Nutritionally Void: soft drinks, whether of the diet or non-diet ilk have nothing of value nutrition-wise. Zip, nada, not a bean. They taste good (some of them), they may quench thirst (again, some of them) but even those with added vitamins are not all that. Artificially-derived vitamins delivered in a sugary, preservative-pumped package are largely worthless. Eat an apple or a handful of grapes instead: nature’s natural vitamin delivery system. As for the ‘with fruit juice’ tag – marketing mumbo jumbo. 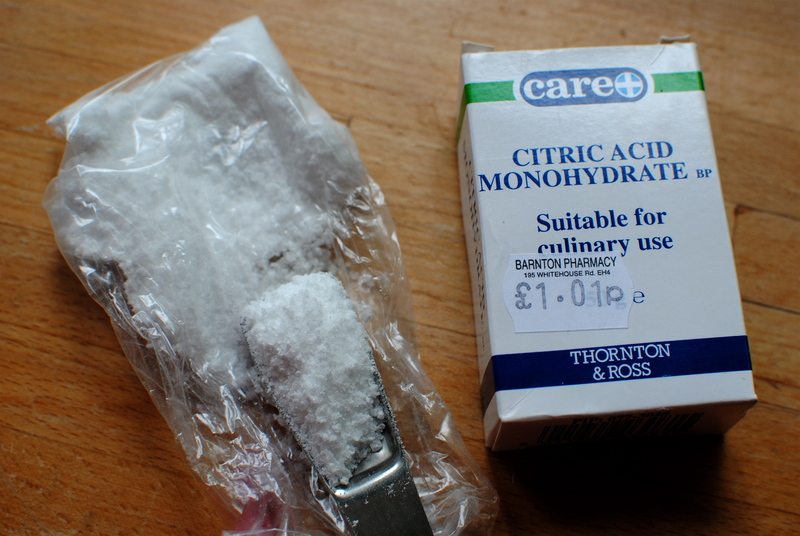 You can have a couple of drops of lemon juice and say that it is ‘with fruit juice’. Again, eat an apple, grab an orange. 2) Obesity Promoter: sweetened drinks add up to being overweight. Even if you ate an otherwise balanced and healthy diet, drinking a 330 ml can of soda a day translates to one extra pound a month. And recent research from Princeton University tells us that high fructose corn syrup (HFCS) may be even worse for us in this respect than regular sugar solutions. Some soft drink manufacturers have deleted HFCS from their ingredients roster (or never had them to begin with) and replaced them with corn syrup, agave nectar or a stevia product (the latter of which is controversial). Still, most commercially made naturally sweetened drinks have a lot of sugar. Check and compare labels for ingredients and total sugars. 3) Diabetes Promoter: this links to number 2. Anything that increases risk of obesity increases risk of type 2 diabetes. Quickly absorbed sugars – in whatever guise, but especially HFCS – upset our body’s ability to produce and process insulin. Over time this disruption can lead to type 2 diabetes. 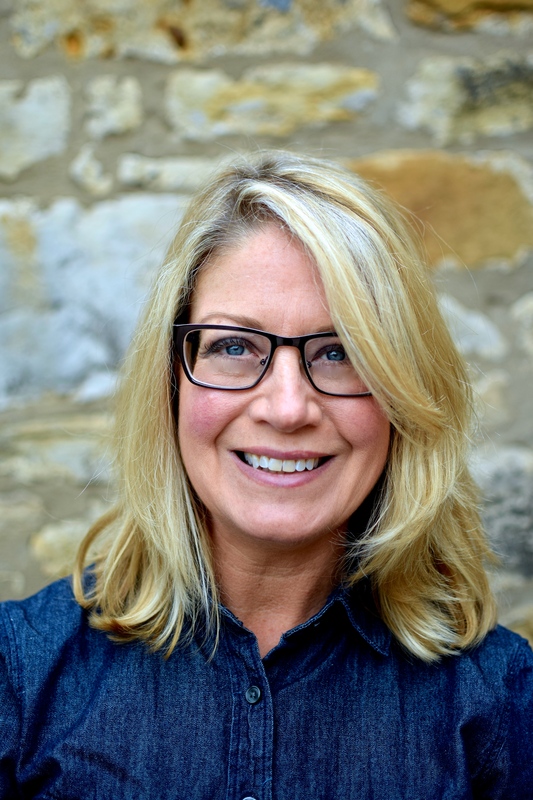 Analysed data from the ‘Nurses Health Study II’ reported that women who drank one or more sugary drinks a day gained more weight and were 83% more likely to develop type 2 diabetes than those who consumed such drinks less than once a month. 4) No-Sugar Added = Not What You Bargained For: because sugar has calories you may think, well I’ll have the diet version; save myself some calories. Artificial sweeteners do have less calories but there is evidence that long-term consumption can bring about undesirable side effects involving the skin, neurological system, gastrointestinal system and metabolic system. Hugo Rodier, M.D., author of “Sweet Death,” suggests that drinking beverages containing aspartame leads to weight gain. Reading into this issue I also saw that the widely-used sucralose (Splenda) may promote weight gain, perhaps due to the fact that although it is touted as a no-calorie sweetener it does have calorie-containing carbohydrates dextrose and maltodextrin (bulking agents). Some people may freely consume sucralose in drinks and baked goods thinking they are calorie-free when they are not. Another point is that sugar substitutes can be very, very sweet and promote our innate sweet tooth. This can cause us to crave sugar even more. The purported side effects of artificial sweeteners are disputed in some quarters, but you may like to read this balanced article from medicinenet. 5) Calcium-leacher: soft drinks are acidic and excess acid takes calcium out of bone. Milk is also being shunned as a drink in favour of non calcium containing drinks, which may account for some of the rise in osteoporosis that is being seen in ageing populations. 6) Kidney Stone Formation: the leached calcium has to go somewhere, and what’s not excreted stays in your kidneys as painful stones. 7) Dental Caries: carbonated drinks, especially sugary ones, erode tooth enamel. This is especially problematic in children. 9) Increased Risk of Metabolic Syndrome: One of a number of studies has shown that soft drink consumption is a significant risk factor for development of metabolic syndrome (aka Syndrome X), which encompasses high blood pressure, high cholesterol, obesity and insulin resistance. Reduce your risk by cutting down on the softies, eating more ‘real’ food and less processed food, losing weight and taking more exercise. 10) Changes to DNA: sodium benzoate, a common preservative used in soft drink manufacturing, has the capacity to interfere with the cell’s power station – the mitochondria. More research is needed to see if the amounts used in soft drink manufacture make it a potential problem for human health. So far, there is no direct link between consumption of non-toxic levels of sodium benzoate itself and any significant health problems. However, a number of years ago it was demonstrated that the combination of ascorbic acid and sodium benzoate in soft drinks can create benzene under certain conditions. Because of this, monitoring and scientific sampling of soft drinks has been stepped up to ensure that levels of benzene do not exceed the standard for drinking water. I would say however that to lessen any potential risk attached to consuming benzene (most of our exposure to benzene is through breathing it in) we should reduce our overall intake of commercially produced soft drinks. The last point does admittedly sound a bit scary, but I have read around the different governmental websites and none of them point to these chemicals as causing harm if ingested with food and drink preparations. People who work with these chemicals have to take precautions as they will be around them in concentration but normal consumers need not worry. Even still, I think it is prudent to consume non-chemical laden drinks where this is feasible. Of course our tap water also has chemicals – and can contain minute quantities of benzene – but on balance the chemicals used to keep our water parasite and pathogen free is better than the alternative. We are all avid water drinkers in my family. Now that I’ve convinced you to cut back on the commercial sodas, what should you be drinking? Water of course is top of the list – we love it with slices of cucumber at this time of year – but black, green and white teas are all fantastic, as is redbush tea. At this very moment I have a mug of soothing ‘tummy tonic’ Teapigs peppermint tea at my elbow. Love all the Teapigs teas, and those from Revolution too. Freshly pressed juices, diluted with water if they are acidic or sweet, are good too, especially if they are predominantly vegetable-based. Studies have shown that the sugar in pure fruit juices doesn’t have the same negative impact as sugar from soft drinks and ‘juice drinks’. In the very near future I will post my best effort at a salt-free V8 type juice, but that’s still very much a work in progress. And I wouldn’t really recommend adults drinking milk but it is fine for cereal, in recipes and in hot drinks. Hopefully you will be getting your calcium from a varied diet that includes unsweetened yogurt, quality hard cheese, most dark leafy greens – especially kale, ground sesame seeds and dried fruits – especially figs, as well as sea vegetables, fish with edible bones such as sardines, and beans. Here is a good list of calcium-containing foods. Organic dilutable cordials are also a great way of having something refreshing and flavourful, but which is mainly water. Sure, you can buy some decent ones but it is very satisfying making your own – and so easy too. 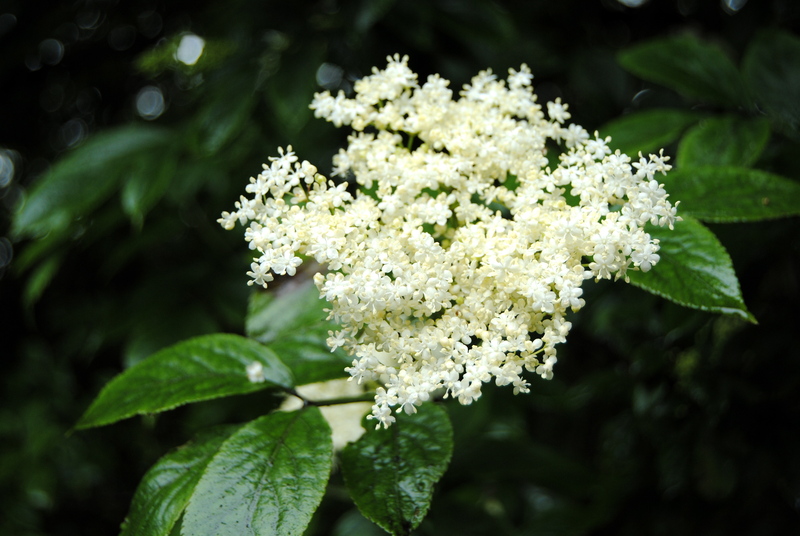 At this time of year elderflowers are in bloom in almost every location where temperate trees flourish. I am perhaps a bit lucky living by a modest suburban forest, where nettles, elder trees, brambles, wild garlic and other edibles grow in rampant abundance. But you too probably live near, or pass by, these extremely useful trees. 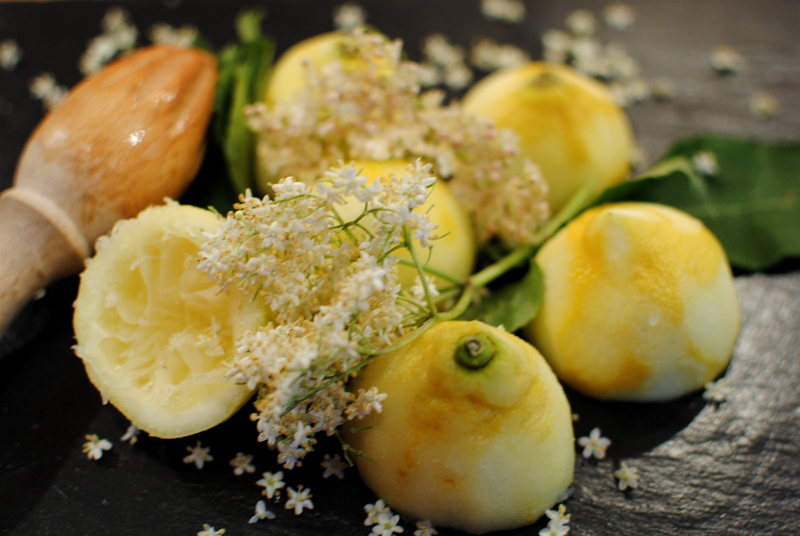 Not only is the flower excellent in cordials but you can add them into cooked recipes and in baked goods for a herbal note, too. Come early autumn the tree’s small round deep-black berries can be made into a Vitamin C-rich syrup, useful when coming into the cough and cold season. There is even a clinically validated commercial elixir made from elderberries. 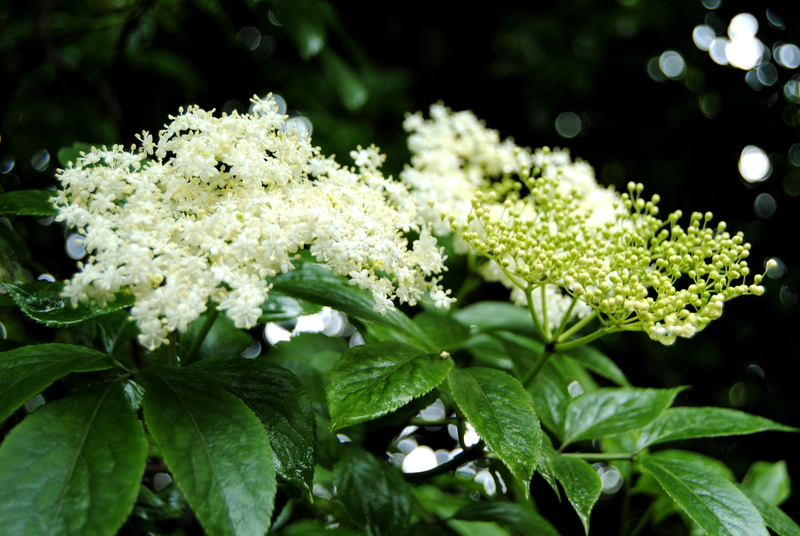 Elderflowers for culinary use mainly come from sambucus nigra, the elderberry tree. 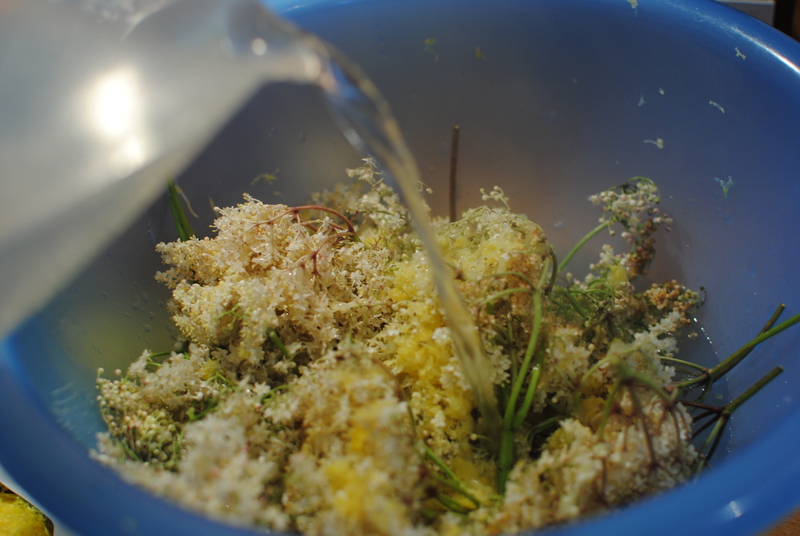 Although the resulting cordial is heavenly – really delicious, be warned that the flowers smell anything but lovely. If I am not using them right away I tend to stick them in the spare room with the door shut. That might just be my nose however, as they are described as having a honey scent (!). What they lack in perfume they make up for in beauty with their creamy white delicate flower clusters. They look a bit like how I would imagine fairy umbrellas would look. I would recommend that you go out and get picking before the season passes. They should ideally be just opened from the bud stage, and before they shed their pollen. Once they open they usually stay at their culinarily useful stage for up to two weeks, if not a bit longer. This cordial does, as you see, use sugar. It acts as a natural preserving agent and sweetener. 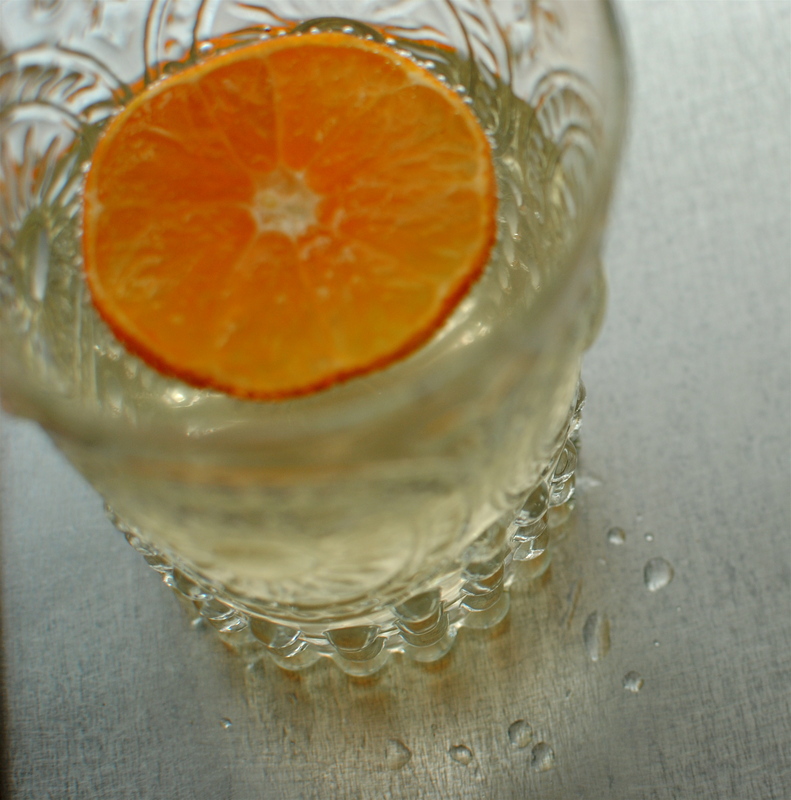 But the great thing about cordial is that you dilute it with plenty of flat or sparkling water to suit your taste. It is also fantastic sparingly used in a fruit salad, especially if one of your fruits is a bit lacklustre, in vinaigrettes and on pancakes or to sweeten plain yogurt. You will probably think of other uses. Some people may even like to add it in to a gin and tonic or a glass of champagne, although I can’t possibly recommend this! Anyway, get out there on a dry, warm day with a pair of scissors, a basket and snip away. Unlike wild garlic foraging there is no risk of passersby smirking at your up-turned rear; all the flowers should be above your head. Watch out for the nettles though. This is only a slightly altered take on Pam Corbin’s recipe from her book “Preserves”, from the River Cottage Handbook series. I have ramped up the lemon and flowers, and slightly reduced the sugar for a sharper, more adult taste. And there’s the gojis, of course. Never seen them in a cordial recipe. I made both a ‘plain’ and goji added batch as you will see from the colour difference, above. Over the years I have tried various methods and recipes but always come back to this one. The only slightly tricky bit is getting enough suitable bottles to sterilise, but that’s because I tend to do a double batch – 4 litres. I save 500 ml and litre swing-top olive oil bottles, but I have also bought ‘fresh’ bottles from Ikea and John Lewis. Any kitchenware place will have suitable bottles, as well as the jelly bags or muslin cloths required for straining. You can use screwtop and cork-topped bottles too. 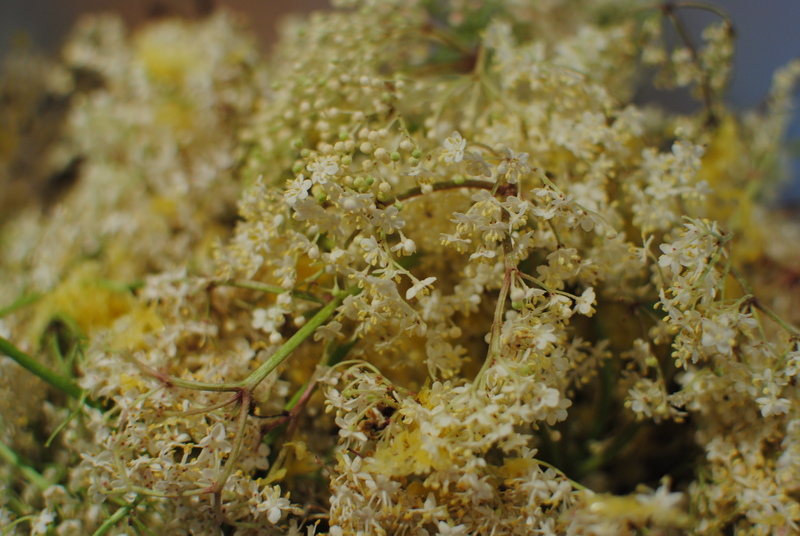 30 elderflower heads (25 if large), shaken gently to remove any beasties! 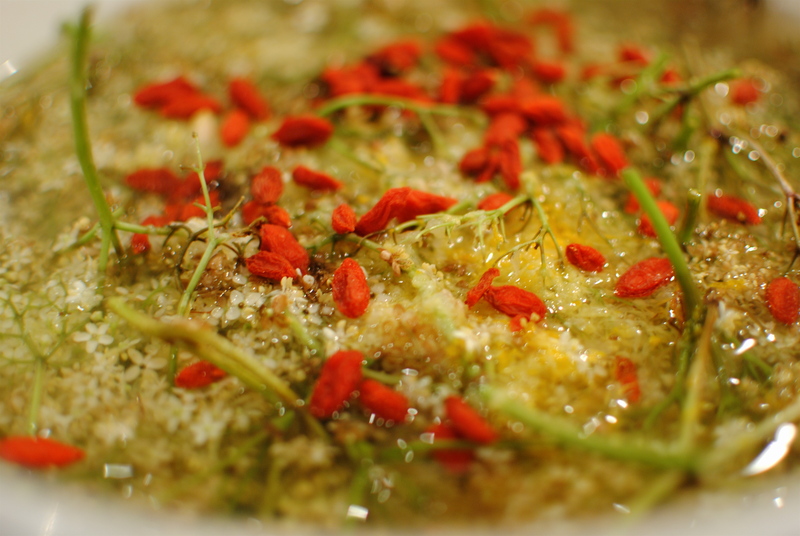 Place the flower heads in a large wide bowl along with the pared citrus zest and goji berries, if using. Bring 1.7 litres of water to the boil and pour over the flowers and berries. Cover and leave overnight, or for eight hours. When the eight hours is up, pinch all of the goji berries (strangely enjoyable) before straining the liquid through a scalded jelly bag or muslin cloth and into a large saucepan. I usually put my jelly making bag (get from any kitchen shop) in a pan and cover with boiling water and squeeze it out when bearably hot. Some folk blast damp jelly bags in a microwave, or iron them. If you don’t have a jelly bag or muslin cloth you could always use a new pair of non-coloured tights/pantyhose – scalded as described. Do try and at least get some muslin cloth though – fabric shop or any place that sells baby supplies. To the saucepan add the sugar, citrus juice and the citric acid, if using. Heat very slowly to dissolve the sugar, then bring up to a gentle simmer and bubble for five minutes. Using a funnel pour the extremely hot syrup to within 2.5 cm of the top of your sterilised bottles, closing them up immediately. If you are using cork, give it a 3.5 cm clearance. 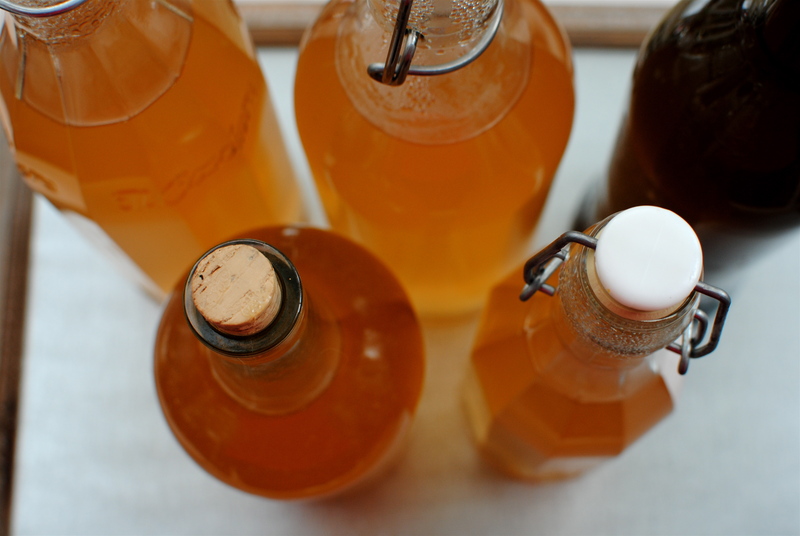 By adding the citric acid and sterilising the bottles you will be able to keep the filled bottles at a cool room temperature for several months. 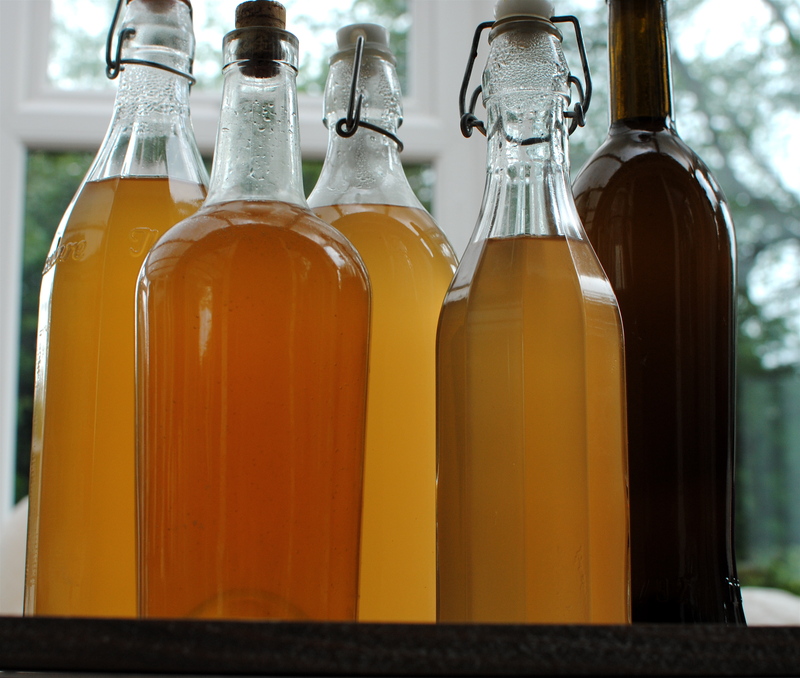 Otherwise decant cooled syrup into clean plastic bottles and store in the freezer; once opened use within two weeks.